Fundraising has always been at the heart of Les Quennevais School. It creates many of the memories that our past students hold close to their heart and, of course, supports our wider community. This year promises to hold as much FUNdraising as year's past, with such events as Christmas Jumper Day and Sport Relief. Our fundraising efforts last year were incredibly successful, seeing us raise over £5000 for Comic Relief as well as lots of money for Eoin's charity, Save the Children and the British Heart Foundation. In 2017, we were selected as a Super Fundraiser for Red Nose Day after being in the Top 3 schools in the UK for fundraising. This event gives us all the chance to let our hair down and have fun together; but also to reflect on how lucky we are whilst making a difference to the world in which we live. 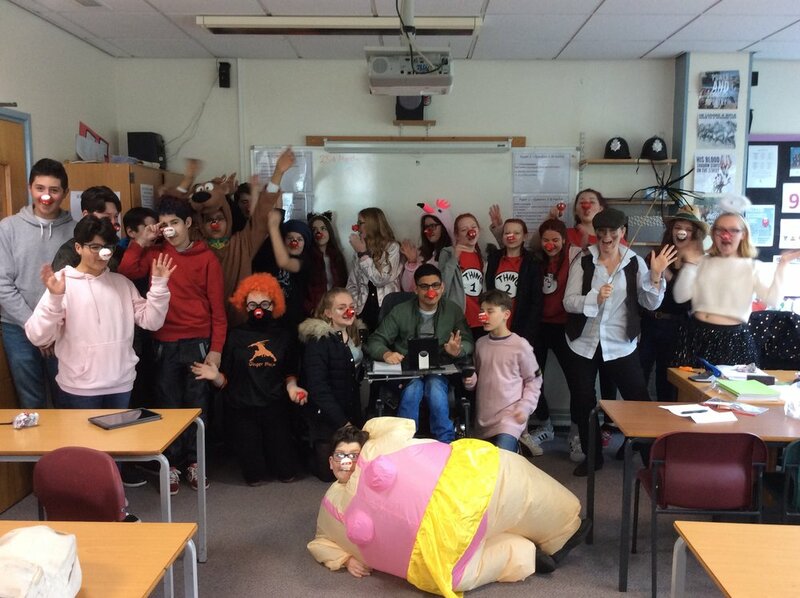 Everyone in the school puts their heart, soul and smiles into creating many Red Nose Day memories and carrying on traditions that have existed since our first involvement in Red Nose Day, such as fancy dress and gunging the teachers. Our students leave us cherishing memories of charitable days like Red Nose Day and Sports Relief and with a caring and kind approach to life.